For a simple many-to-many database relationship, you can use the @ManyToMany JPA annotation and, therefore, hide the join table. In this article, we are going to see how you can map a many-to-many database relationship using an intermediary entity for the join table. This way, we can map additional columns that would be otherwise impossible to persist using the @ManyToMany JPA annotation. The @Embeddable type must override the default equals and hashCode methods based on the two Primary Key identifier values. The @NaturalId annotation allows us to fetch the Tag entity by its business key. The @Cache annotation marks the cache concurrency strategy. The @NaturalIdCache tells Hibernate to cache the entity identifier associated with a given business key. For more details about the @NaturalId and @NaturalIdCache annotations, check out this article. With these annotations in place, we can fetch the Tag entity without needing to hit the database. Notice that the Post entity features the addTag and removeTag utility methods which are needed by every bidirectional association so that all sides of the association stay in sync. While we could have added the same add/remove methods to the Tag entity, it’s unlikely that these associations will be set from the Tag entity because the users operate with Post entities. 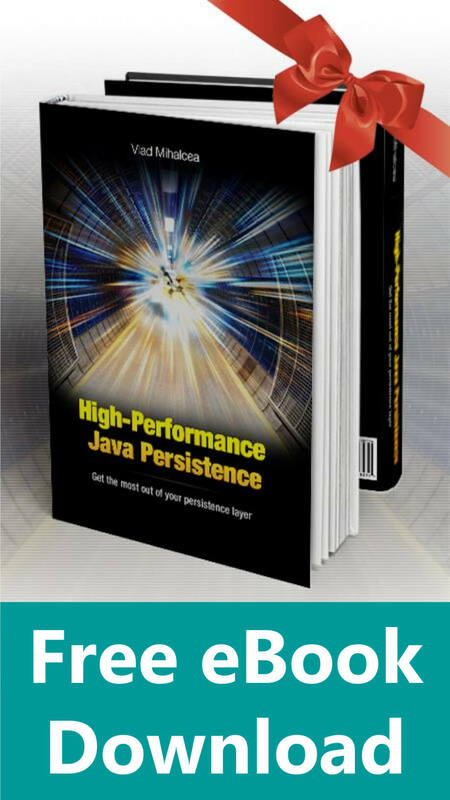 "High-Performance Java Persistence 1st edition"
"High-Performance Java Persistence 2nd edition"
However, if you don’t need to navigate all Post entities associated to a Tag, you can remove the posts collection from the Tag entity and this secondary SELECT statement will not be executed anymore. The Tag entity will not map the PostTag @OneToMany bidirectional association anymore. The PostTag entity and its PostTagId @Embeddable are identical with the previous example. 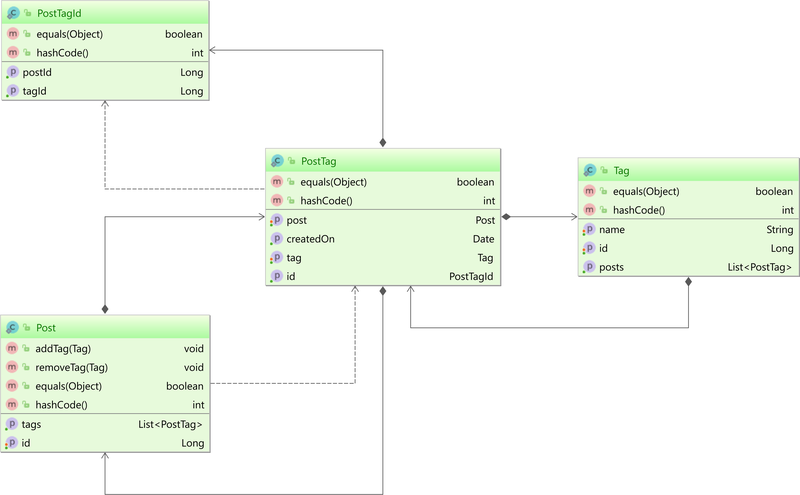 Inserting the PostTag entities is going to render the same SQL statements as seen before. While mapping the many-to-many database relationship using the @ManyToMany annotation is undoubtedly simpler, when you need to persist extra columns in the join table, you need to map the join table as a dedicated entity. Although a little bit more work, the association works just as its @ManyToMany counterpart, and this time we can List collections without worrying about SQL statement performance issues. When mapping the intermediary join table, it’s better to map only one side as a bidirectional @OneToMany association since otherwise a second SELECT statement will be issued while removing the intermediary join entity. In trying to implement this, I’m running into an infinite loop in the response. Any ideas why this might be happening? I tried adding @JsonIgnoreProperties and have had no luck. It sounds like a JSON serialization problem. Use @JsonIgnore on the child side of the bidirectional association. Don’t use Lombok with JPA and Hibernate. For more details, check out this article. Thanks for the help on this! I was finally able to get this working and have detailed it in my StackOverflow. Basically, my issue was that I had mistakenly named a method prepended with “get” in my class. This was causing that method to be added to my object, which was not being ignored, so THAT was causing my infinite loop. Thank you both again for the replies, and thank you always for the great content Vlad! This article proved very helpful to me. However , I want to know how can I set the value of extra column (in your case created_on) and persist into database. I am trying to do similar for my project but I am not able to insert the data. Thanks for appreciating my article. 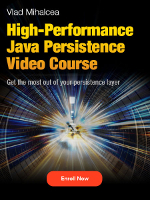 You can find a solution to your problem in the Relationship module of my High-Performance Java Persistence video course. Enjoy watching the videos and fixing your issues. Hello everybody. How can I make a search query for posts by tags? Of course, you can. 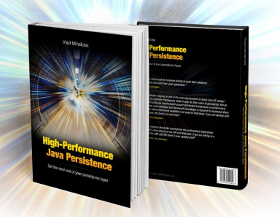 Check out my High-Performance Java Persistence book for more details. Why postTag.getTag().getPosts().remove(postTag); doesnt throw Lazy load exception? All the code is on GitHub so you can check it out. Thanks for this great article! I have one query though. If the many to many relationship is only with one table rather than 2. How can we achieve that? Does this above example applies to this case as well? This question is too complex to answer in a comment. You need to ask it on the Hibernate forum. In your opinion is possible to use @SQLDelete to update an entity on CascadeType.REMOVE with an @Embeddable id? Try to replicate the use case in my High-Performance Java Persistence GitHub repository and send me a Pull Request when it’s done. I’ll check it out afterwards. Why can’t I create a new Tag, persist it, create a new Post, add the previous tag to it and then persist it? I get a detached entity error and I’m struggling to fix this. I’ve put up the question on SO but had no helpful answers (https://stackoverflow.com/questions/53997499/how-to-do-unidirectional-many-to-many-relationships-with-already-existing-regist). Check out the Relationship module of my High-Performance Java Persistence video course. Not only that you’ll find the answer to your question, but you are going to learn other useful tricks as well. I have only one question. Is there a way to avoid having to manually set the IDs for Post entities before persisting them? I.e., is it possible to use a @GeneratedValue for Post IDs and have the association table use that value? Yes. You can use generated identifers for parent entities: Post or Tag. Only the PostTag child entity requires a composite identifer which cannot be auto-generated since the ids are taken from the Post and Tag entities. However, I ran into another problem. Any ideas why this happens and how to solve it? All the test cases in this article are on GitHub and they run like a charm. Try to compare my test cases to yours and see where they differ. 1) You are assigning IDs to Post entities manually through the setter method while I’m using @GeneratedValue(s). 2) You are persisting Post entities by calling EntityManager’s persist() method, while I’m doing the same by calling the save() method of my @RepositoryRestResource interface which extends CrudRepository. The models are pretty much identical. The save method should call persist if the id is null. You can change my examples to use @GeneratedValue and they will still work. You also need to do a comparison debug to see why your example is not working. The static part didn’t work with my compiler and when I looked more it seems like a static class only can be nested inside another class, i.e. not top level. Should the PostTagId be inside something else, like PostTag? Or have I misunderstood? The classes are static in my unit tests as they confined to the test class. You don’t need to use that in your application. Could you please explain if this self reference in the PostTag mapping entity is not causing issues? I tried serializing the Post class directly and what you get when you see the JSON for tags is a long descending nest of Post -> Tag -> Post -> Tag, etc. Does JPA handle this in the background and not recognize this or will this potentially cause serious memory/performance issues? Is this resolved by the FetchType.lazy? What if I just want to call a FindAll() and get back all the Tags? Do I need to make a second query somehow? 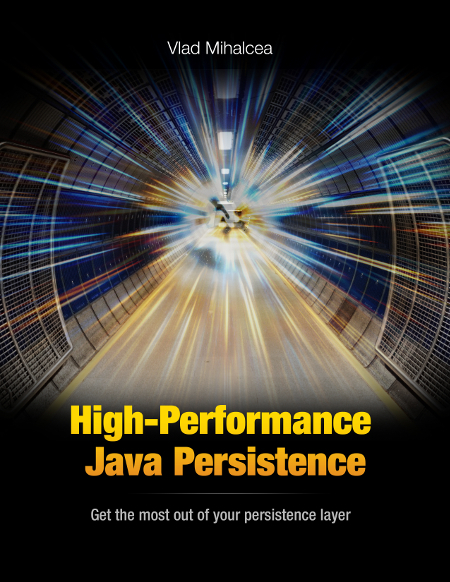 JPA is about persisting data into the database. It has nothing to do with JSON which is handled by Jackson. You need the @JsonIgnore annotation on one side of a bidirectional association, and that applies to any hierarchical model, not just to JPA entities. I’d like to thank you for your blog. There is a plenty of great material about persistence. 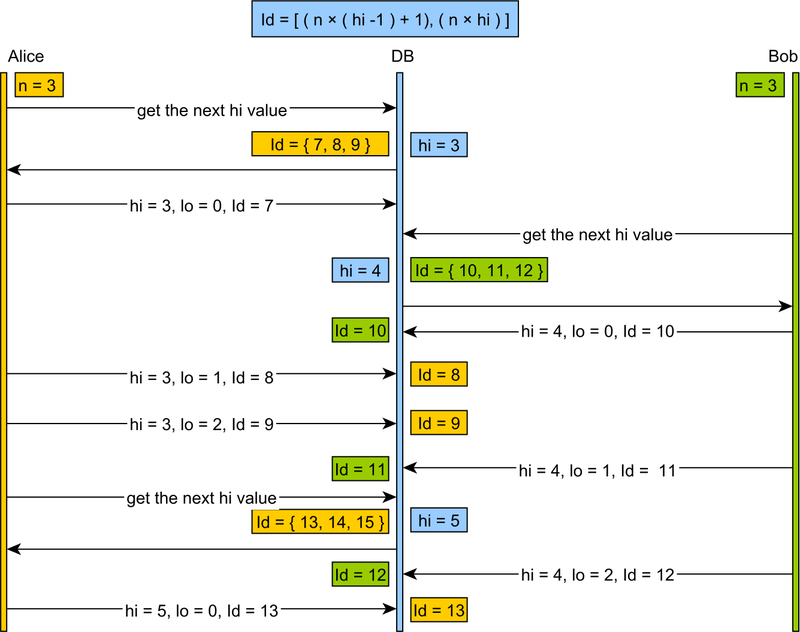 @vladmihalcea, I followed the tutorial described above to implement a many-to-many with extra attribute (in my case a list of integers). Nevertheless, it is not working as expected. The code succesfully saves the data into the database since I can check the data directly on the DB console. But I’m unable to load a domain class from the other endpoint. On the other hand, if I create a JPARepository to access the intermediary entity I’m able to retrieve the data. Do you have any tip about how to fix it? All the code for these tutorials is on GitHub, and it works just fine. Compare your implementation with mine and see the difference. Hi, What about doing this with Kotlin? Is kind of nightmare handling inmutability and secondary constructors and so on… Thanks! I haven’t used Kotlin, so maybe the Kotlin devs can help you with your question. Is it possible when saving a Post, to use cascade to also persist new Tags that were added to the Post? As I see it, this solution works only when both Post and Tags have already been persisted (because only then you know their ids to form the @EmbeddedId). I think it should work with @EmbeddedId as well if you are using @MapsId. we have some issues working with this kind of table configuration. 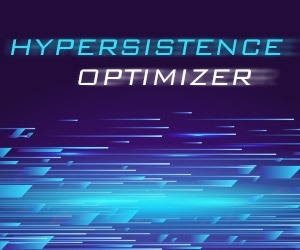 We are using Hibernate version 5.3.6. 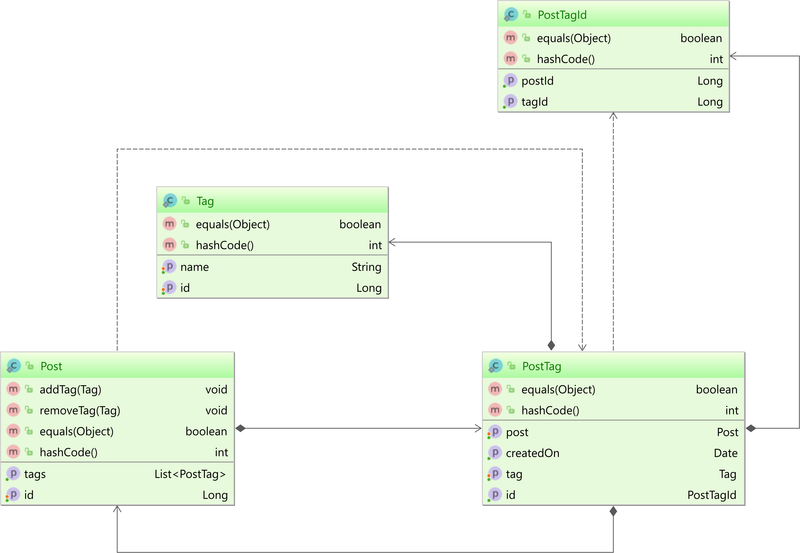 We are not able to load data into the mapped class even if the query generated by hibernate looks ok. In order to have the query running properly we had to add the @JoinColumn annotation in @MapsId as by default hibernate add an _ID at the end of the map class. Note that we have a maximum of 4 rows per table. We have a jvm error when trying to access collection object. We also have these Hibernat error. I am getting a detached entity passed to persist error. This is resolved when I remove Cascade.ALL but in that case, the mappings are not saved in the intermediary table. I think this is an open issue in Hibernate. 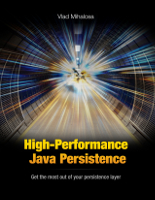 For a better understanding of this topic, check out my High-Performance Java Persistence book. 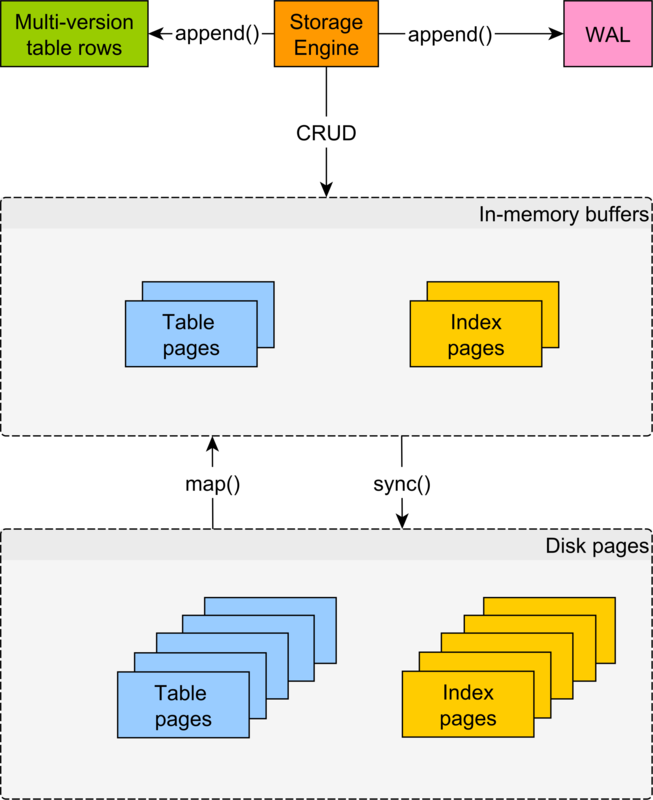 Is the ManyToMany relationship the only one that can be used when extra columns are needed, or can one half use a OneToOne relationship as asked in this question (https://stackoverflow.com/questions/52337224/hibernate-onetoone-mapping-with-join-table-broken-column-mapping-exception)? You can find the answer in the Relationship chapter of my High-Performance Java Persistence book. I purchased your book and read through the Relationship chapter completely. I reconfigured my code to match your example in 10.5.3. It works fine like that, but if I make one a OneToOne relationship, I get an error of “Referenced property not a (One|Many)ToOne: domain.workorders.WorkOrderInspection.inspection in mappedBy of domain.inspections.Inspection.workOrderInspection”. So I still can’t find an answer to whether a OneToOne can be used. Any thoughts? Thanks! Send me a Pull Request to the high-performance-java-persistence GitHub repository where you replicate this issue so I can better investigate it. Thanks for sharing this example. I have followed exact same example, but my hql with join was failing when I added JoinColumn on PostTag like given below, it was working then. If you can update the article accordingly, it might be helpful to someone. Thank you again for sharing this. Everything works just fine on my GitHub repository and those join columns are used by default anyway. Thanks for these great resources, but I have to agree with Vishal’s suggestion given above. I was constantly getting EntityManagerFactory exception, until I introduced these two annotations to the joined table. It is probably caused by some versioning issues (or possibly naming Hibernate’s conventions conflict). If you want, I can provide you with current versions of my stack. If you can replicate it with the latest Hibernate, you should open a Jira issue. Use this template for the test case. Check out my consulting page for more details about answers on demand. thanks for posting, your posts are very helpful. I’m reading your posts often. I’m buiding a spring-boot aplication, and in dev aspect I set Hibernete to autocreate database tables and it works fine. I used your post to map relation between company and it’s socialMediaAccount and indeed it works fine, except that when Hibernate creates midle-table it creates columns: company_id, sm_id, _path (thats OK) and additional two columns: company_company_id and social_media_acount_id. I tested and realized that first two FKs are from composited key class (CompanySocialMedia in my case) and last two FKs are actualy PKs from Company and SocialMedia classes. I googled for solution, but I can’t understand how to get rid last two columns in table. Do you have some advice, please. 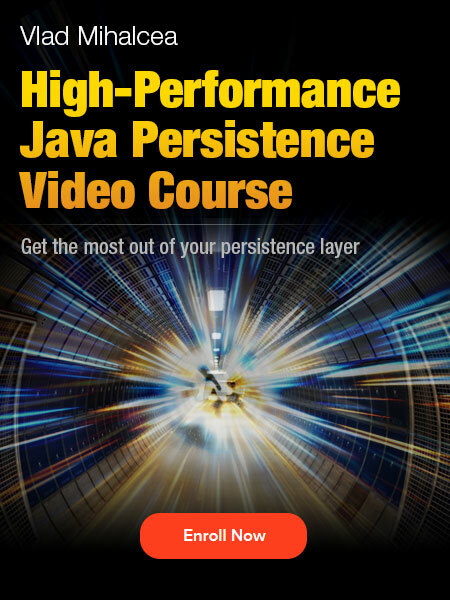 Check out the Relationship module of my High-Performance Java Persistence video course. You will surely find the solution after watching those videos. Suppose the extra column be another entity. This new association could be an unidirectional ManyToOne? You are going to understand the answer in my Relationship Module video course. Enjoy watching it! Hi, thank you for the post. I just didn’t understand why the date is the primary key in the join table. Wouldn’t it be better to just have an extra id attribute? Or it doesn’t matter? The date is not the PK in the join table. The PK is a composite of 2 FKs. Could you provide an example of how your case could be implemented using JPA Criteria? The problem you have is because you issued a JOIN FETCH while the select clause does not contain the root entity, but something else, like a projection.